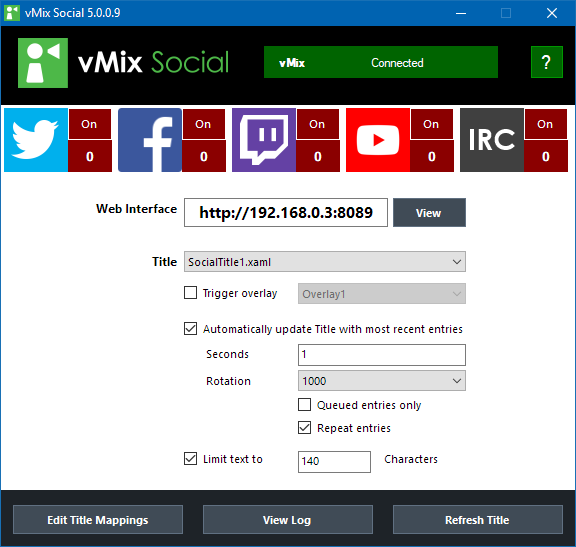 vMix Social requires a copy of vMix 12 or higher installed on the same machine. vMix Social is responsible for collating and organising social media content before sending it to vMix for display. You can use one of the Title templates included with vMix Social or create your own using vMix Title Designer which comes with vMix. Click Add Input, select the Title / XAML tab and browsing through the Social or GT Social tabs. Click Add Input, select the Title / XAML tab and click Browse to locate your custom template. Double click the vMix Social icon to start the application. Note: vMix Social needs to be started on the same computer as vMix. Copyright © StudioCoast Pty Ltd. All Rights Reserved.